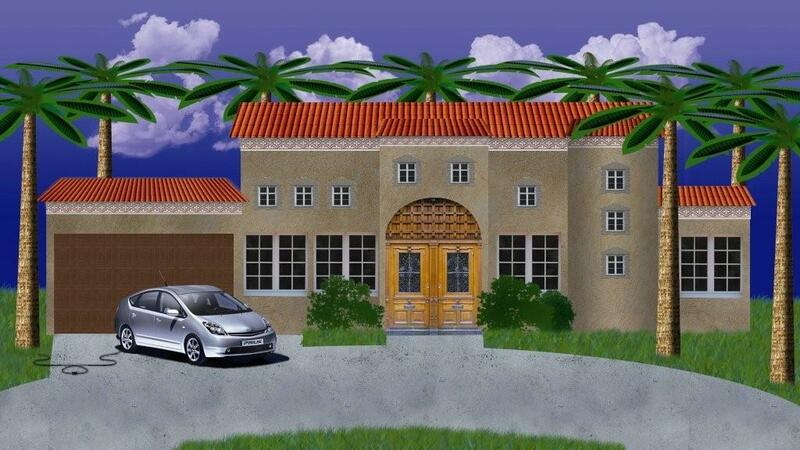 A stand alone or grid interactive hybrid solar array/wind generator constructed to have the appearance of a palm tree. Electrisitree generates electricity using either wind or solar power, while not diminishing the appearance of or interfering with the structure or replacement of an existing roof. Electrisitrees hybrid wind feature has a solution for the main challenges with solar power, nighttime. A Burlingame entrepreneur who thought rooftop solar panels were unsightly has come up with a green idea that he hopes takes root: a palm tree that absorbs solar energy. Greg Strang, a real estate agent, said he was traveling home from New York City four years ago when the topic of solar energy came up with another passenger. The growing popularity of solar panels — which capture renewable energy generated from the sun — should lead to new forms of solar panels that are more attractive than the common gray, flat panels seen on top of buildings, Strang said. His resulting invention, the Electrisitree, is the answer to that problem, he said. The fronds on the artificial palm tree, when put outside, would absorb light just like solar panels, said Strang. “They’re more aesthetically pleasing,” Strang said of the product. Eventually, Strang said, he plans to develop a version of the Electrisitree that would have spinning branches, so the machine would also function as a turbine, to capture wind power. Strang estimates one eight-foot tall tree would cost homeowners roughly $15,000 to install. One tree generates roughly 800 watts of power, according to Strang. It would take eight to power a 1,200-square-foot home, Strang said. Strang said the idea is the answer to a former ordinance in the town of Hillsborough in 2005. The ordinance, which has since been lifted, prohibited solar panels because of their look. The concept comes at a time when cities throughout San Mateo County are encouraging solar energy and green building construction. Casey Martin, administrator with Sustainable San Mateo County, said interest in solar is growing throughout residential communities. Its popularity could eventually create alternatives in looks in design compared to the current panels. The solar industry defines the term “stand alone” as produces, stores and supplies all the energy needs of a “load”, such as a residence, without being connected to the grid. 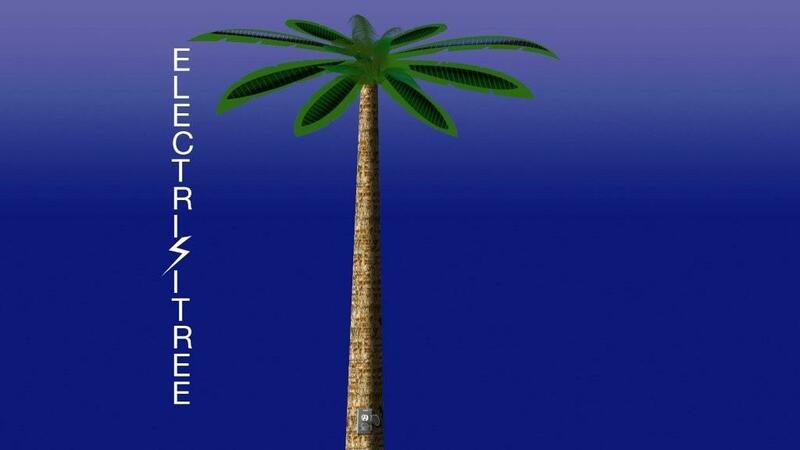 Electrisitree is a stand alone power generating plant that actually “stands alone”. Additionally, Electrisitree will not diminish the appearance or interfere with the structure or replacement of an existing roof, while looking good in the process. Electrisitree is low maintenance, self contained and can be erected anywhere. The array has dual axis tilting (both seasonal and azimuth) to follow the path of the sun thus maximizing wattage output. Unlike other solar systems where shade can diminish the efficiency of solar modules by up to 90 percent, Electrisitrees’ solar modules are located above the shade; therefore receive uninterrupted solar irradiance maximizing efficiency. The photovoltaic modules (moduleaves) are in the shape and have the appearance of palm leaves. The balance of system components, such as batteries, AC/DC converter, charge controller, MPPTS (maximum power point tracking system) and wiring are located in the ground and Electrisitree trunk which is constructed to withstand the elements. Moduleaves of each Electrisitree contains enough solar cells to produce 600 Watts of power. The 12 volt gel batteries are engineered to be extremely low maintenance and have a storage capacity of 34 Ah (amp hours). Electrisitree could accommodate battery banks with a storage capacity of over 300 Ah. Electrisitree can be wired to the electrical system of your home or business. The trunk of Electrisitree features an external outlet. The external outlet is envisioned at this time for charging your electric vehicle and functions not yet imagined. Several versions from smaller solar only portable versions to the revolutionary hybrid wind/solar version are in development. It is estimated the annual Kilowatt output of the hybrid version will replace the energy produced from the burning of many barrels of oil.